In my seemingly endless task of reading all the books I need to read and all the books I want to read without killing myself I have decided I need to narrow my list down to just a few books. 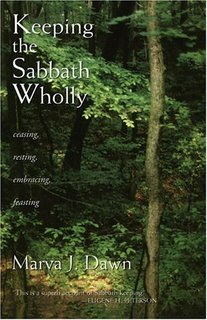 Today I picked up Keeping the Sabbath Wholly by Marva Dawn. It was recommended to me and I heard she cites Abraham Joshua Heschel a lot o it can’t be bad. So my plan is to make Dawn’s book my only pleasure read until I’m finished with it. Then I’ll move on to something else. I can’t keep up trying to read eight books at a time… it’s just not a good way to learn. 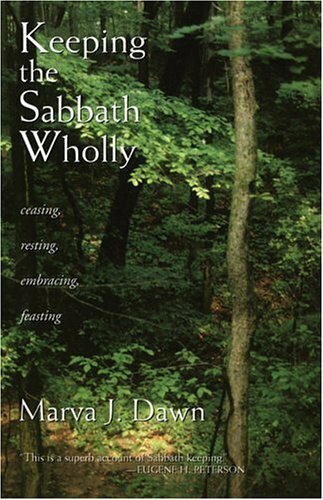 For prayer and reflection I picked up another book as well. It’s called Celtic Praise. It’s a compilation of Celtic prayers and meditations. I’d like to share one with you. Please consider the depth and honesty. I roam where no grass will grow. By day the sun is shrouded in dark clouds. Fruits shrivel before they ripen. God has withdrawn his blessings. He has decided to test my faith. Even in this bleak, harsh wilderness? I want to curse him. Let my curses melt into blessings. Rest in reflection and watch as even your curses melt under the flame of God’s love into the blessing of abundant life.